Detroit's auto heritage is known worldwide, but this fascinating city's history runs much deeper. Step inside the tiny recording studio where Berry Gordy, a young entrepreneur who faced tremendous prejudice, created a music empire that broke down racial barriers. Tour Art Deco masterpieces so spectacular they're called "cathedrals" to commerce and finance. Walk in the footsteps of Dr. Martin Luther King Jr. to Cobo Hall, where he first delivered his "I Have a Dream" speech. Join Karin Risko for an intimate tour of the city that put the world on wheels and discover an amazing history of innovation, philanthropy, social justice and culture. 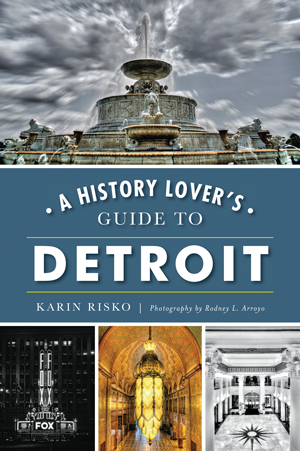 Detroit native Karin Risko is the owner of City Tour Detroit, formerly Hometown History Tours. She enjoys learning about new developments underway in the city as well as continually uncovering juicy historical tidbits. The former history teacher earned a bachelor’s degree in secondary education with a major in history from Central Michigan University. Karin is the co-author of another History Press publication, Michigan Civil War Landmarks. Learn more about Karin at CityTourDetroit.com.